With state backing, the Dyersville Industrial Park will get a boost from the land down under. On March 26, the Iowa Economic Development Authority approved plans by Digga, LLC, to build a 36,680 square foot facility in Dyersville. The motion will grant $240,000 in financial assistance for the $2.2 million capital investment. It will allow the company to build its first site in North America and second international branch, creating roughly 30 jobs in the region. Based near Brisbane, Australia, the company specializes in manufacturing and exporting parts and equipment in the earth moving industry; it is one of Australia’s largest manufacturing firms. President, CEO and co-owner Suzie Wright stated that after considering nearby Manchester and other towns throughout Iowa and Texas, the company chose Dyersville for its amenities. Wright is familiar with the area having done business with Paladin Construction Group in Delhi. “We know a lot of people throughout the region,” she said in a phone interview. When scouting for space for the plant, Wright said she was impressed with the presentations prepared by Dyersville Executive Director of Economic Development Jacque Rahe. 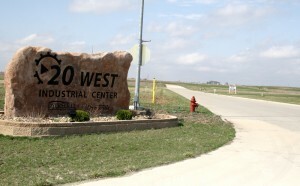 Dyersville’s Industrial Park offers Highway 20 visibility and is a short drive from Peosta’s Northeast Iowa Community College (NICC). For Rahe, approval puts a cap on over two years of work enticing the company. She called Digga “the new anchor” to the industrial park. The new Dyersville branch will focus on manufacturing excavation products, screw anchors and auger drives. Digga will be introducing a new product line for its North American facility, hiring workers at wages starting at $15 per hour. Another strength Rahe promoted is the company’s reputation for healthy work environment and employees. With confirmation from state economic development, and expected approval of a Tax Increment Financing agreement (TIF) from the Dyersville City Council, Wright and several top executives are planning to move to town to oversee construction. Once the plant becomes fully operational, she will spend six months a year in Dyersville. After seeing schematics for the new building, Wright stated the move will be an adjustment for her. She hasn’t constructed a building to endure Iowa winters until now. The company is expected to break ground in April and become operational this fall.